Team members at last year’s Illinois competition! Check out our newcomer guide! The password is in the email you just got with the link to this page. Click here to access. Join our Facebook group! It’s the hub of our community where we post event reminders and announcements during the week (also the many, many lost and found items people leave after lessons!). Check it out here, and just hit request access. Make sure you’ve added your Michigan email address to your Facebook account or you won’t be able to join the group, there’s instructions about how to do this here (if you aren’t a Michigan student please contact ballroom-exec@umich.edu and we’ll sort it out). Ballroom buddies! Our team is so large and complicated, it can be confusing when you first join. 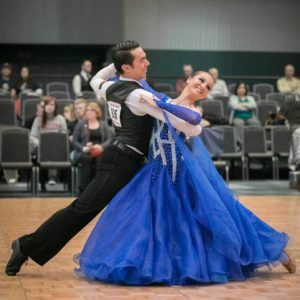 With this in mind, we’ve developed a ballroom buddy scheme: if you are a new member of our team, you can sign up to be paired with a returning team member that has volunteered to help you feel welcome and answer any questions about competitions/looking for a partner/anything and everything ballroom related. Your buddy is not responsible for teaching you dance moves or meeting with you all day every day (unless you both want to), but rather serves as a point person and guide to the team. Sign up for both newcomers and returning team members can be found here (deadline is 11.59pm on Friday). Calendar: The team has its own Google calendar, available here, which you can use for reminders for all our events during the week and to see what competitions are coming up! Speaking of competitions, for those of you who’ve signed up, the payment deadline for Illinois is Wednesday! The registration fee is $42 per person, please don’t be a jerk and make Clara hunt you down! Remember to pay registration directly to the team, don’t pay on O2CM!!! Showcase videos are up! Recruitment may be over, but the memories live on. Relive the magic of your favourite performances here. 9-11pm: Newcomer review lesson! Missed the lesson last Saturday, or just want to come back and learn the steps again? In this two hour lesson, you’ll catch up on what we covered on Saturday! 9-11pm: Newcomer waltz mini-lesson/partner search! Come and learn the basic step for a new dance, and find a partner to practice or attend Purdue with! Sign up for Ballroom Buddies, the deadline is tonight! 4.30-6pm: Newcomer lesson with Steve and Susan! 7-8pm: American Tango 1 <- Newcomers come to this one! Check out the club website here. Shoe vending is coming soon on October 9th, 10-12pm! Newcomers, this is the perfect chance to get your hands on a pair of those fancy shoes you’ve seen other team members wearing. More details to follow next week! Save the date for the Ohio Star Ball aka OSB aka NATIONALS!!! OSB is the most fun competition of the year and we’d hate for you to miss it, so save the date for November 17th-18th! Looking even further ahead, our big competition in the Winter Semester is the Arnold Youth Dancesport Classic hosted by Arnold Schwarzenegger himself, which is March 2nd-3rd (the first weekend of Spring Break). Plan your break so you can attend and see the one and only Governator!